Open every day from dawn-to-dark, you’re invited to enjoy 19+ miles of trails on foot, snowshoes or cross-country skis through 1,200 acres of diverse ecosystems. Get out on the trails to take in spectacular views of the natural world while observing the plants and animals that call this area home. fires, alcohol, picking or collecting. 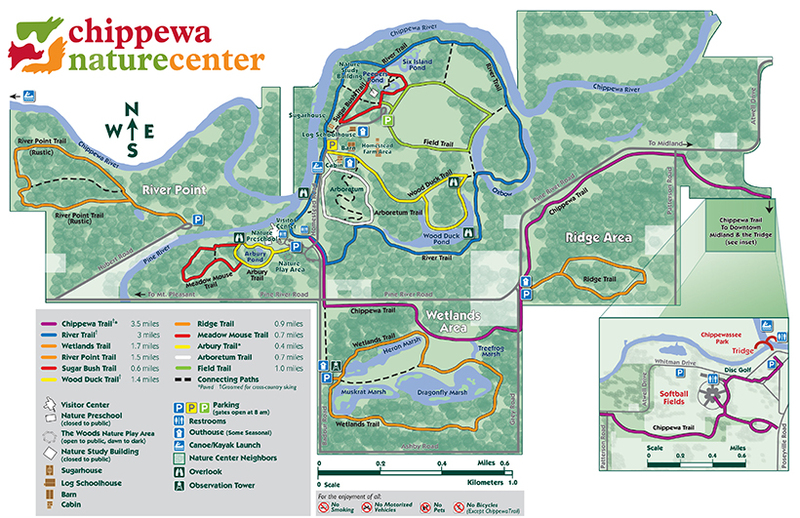 Pets are not allowed on Chippewa Nature Center property. 4/9/19 - Trails are dry and ready for use! There may be an occasional muddy spot, but for the most part, they are good to go. Venture out! 3/18/19 - The Ridge, Wetlands and River Point are all open and ready for hiking; please use caution, as there are some slippery spots. Homestead Road and area, and the Sugarbush and Sugarbush Trail (including Rent-a-Sap Bucket area) are also open. All other trails on the main property are closed due to flooding and icy conditions. 3/6/19 - There's is a solid base with an inch of snow on top for skiing on the River and Chippewa trails. We are no longer grooming or setting track due to lack of snow. Venture out while you still can! 2/27/19 - The River Trail and Chippewa Trail are freshly groomed (no track set) and conditions are perfect for cross country skiing. Venture out! 2/21/19 - All trails are now open! 2/18/19 - The River Trail and Chippewa Trail now groomed. Homestead Road is also now open. 2/15/19 - The River Trail is now groomed. 2/13/19 - The River Trail and Chippewa Trail are rolled. Due to the icy conditions under the snow, we are not able to groom the trails. Parking is only available in the Visitor Center lot at this time. Homestead Road, the Wetlands Area and the Ridge Area continue to be closed. Trails accessible from the Visitor Center parking lot are open. 2/8/19 – Due to extremely icy conditions, CNC trails are closed until further notice. 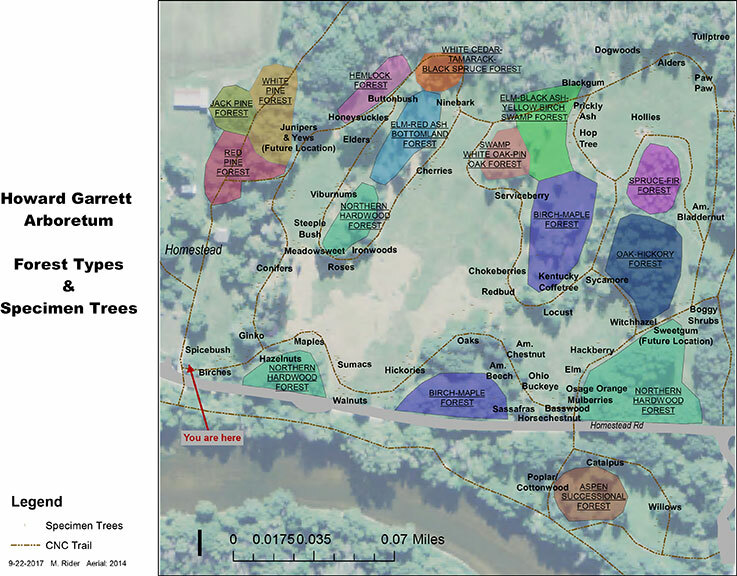 Learn about Michigan-native trees and shrubs in the Howard L. Garrett Arboretum. Drive 3 minutes to 2 miles of trail loops. Walk through a hemlock and birch woodland and see the River Point Pond and Chippewa River. A 0.4 mile paved loop. See four ecosystems and how they have been managed on one of our shortest trails. Enjoy an overlook of the Pine River. Drive 3 minutes to this 1.5 mile loop. Follow a sand beach ridge of an ancient lake and see where fields are turning into young woodlands. A 2.7 mile loop. Walk our longest trail along the rivers, through the Beech-Maple Woods, Oxbow Woods and wetland, and over old river beds. Walk, bike or in-line skate to downtown Midland on this 3.5 mile, non-motorized paved pathway. Interpretive stops along the route tell the exciting story of this unique landscape. This is the only Chippewa Nature Center trail where bikes are allowed. A 0.6 mile trail. Walk through the Homestead Farm, then hike along upland fields and woodlands to reach the Oxbow. Drive 2 minutes to this 1.7 mile loop. Explore all our wetland types, including our biggest marshes. Trail includes a two-story accessible observation tower, docks and a boardwalk.